Nearly every business is being revolutionized by data and the ability to capture, connect, analyze and interact with it. One example that Intel is especially excited about is how data is re-inventing the way people consume and interact with sports media. It is one aspect of what Intel CEO Brian Krzanich calls the digitization of sports. At the recent NBA All-Star Weekend we delivered an immersive 3-D viewing experience to fans watching on TV and online that provided a taste of what’s to come. The NBA All-Star Weekend experience showcased “free dimensional” or freeD™ video from Replay Technologies, optimized for 6th Generation Intel® Core™ processors and Intel server technology. 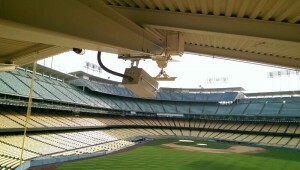 The freeD technology created a seamless 3-D video rendering of the court using 28 ultrahigh-definition cameras positioned around the arena and connected to Intel-based servers. This system allowed broadcasters to give fans a 360-degree view of key plays – providing thrilling replays and highlight reels that let fans see the slam dunks, blocks and steals from almost every conceivable angle. Intel has been collaborating with Replay since 2013 to optimize their interactive, immersive video content on Intel platforms. As a natural next step in our collaboration, today we’re excited to announce that Intel signed an agreement to acquire Replay Technologies. Founded in 2011 and headquartered in Israel, Replay’s proprietary freeD format uses high-resolution cameras and compute intensive graphics to let viewers see and experience sporting events from any angle. Together, we will scale this new category for sports entertainment that we call immersive sports, which is attracting the attention of leagues, venues, broadcasters and fans. Immersive sports requires the high-performance computing Intel is known for, and it’s also data driven – fueling the continued build out of the cloud. For athletes, coaches, broadcasters and fans, the ability to capture, analyze and share data adds compelling new dimensions to the game. As part of Intel, the team will focus on growing their existing business and advancing their technology with Intel to deliver faster freeD processing and new features like the ability to manipulate and edit personalized content. Technology now plays an unprecedented role in sports … and we’re just getting started. To learn more about Replay freeD technology, visit Replay Technologies’ website. For more on how Intel is pushing the boundaries of sports, visit Intel’s website. Wendell Brooks is senior vice president of Intel Corporation and president of Intel Capital.